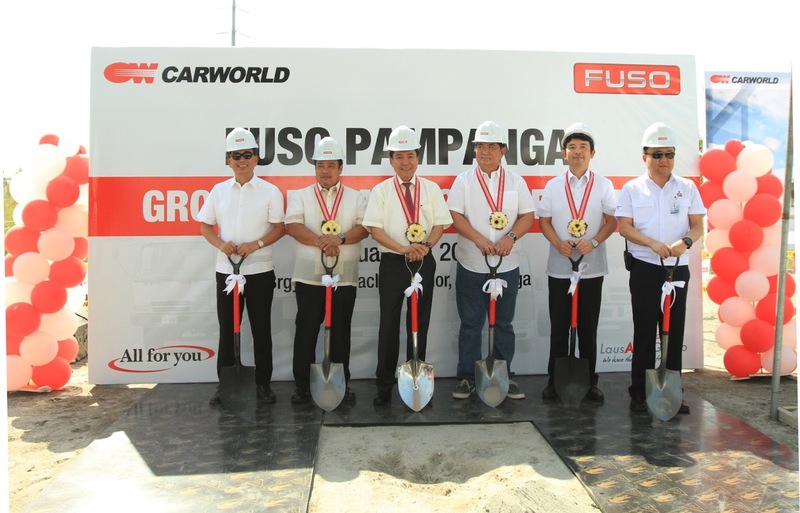 Mitsubishi Motors Philippines Corp. (MMPC)’s authorized dealership, Carworld Inc. (CWI), recently broke ground for the establishment of its first FUSO dealership in Bacolor, Pampanga last February 10, 2017. CWI was able to acquire the 1.4-hectare land in Brgy. Macabacle, Bacolor, Pampanga in which 5,000 sqm area of the land will be turned into facility area. The showroom will be capable of displaying all truck models from light duty to heavy duty. The service workshop will contain six (6) medium duty to heavy duty bays including intensive inspection and multi-purpose bays. Carworld FUSO Pampanga is expected to start operation within 2017. The groundbreaking ceremony was attended by Shigeru Ogura – EVP – Vehicle Sales and Marketing of MMPC, Mr. Dante C. Santos – FUSO FVP – Vehicle Sales and Marketing of MMPC, Mr. Liberato P. Laus – Chairman and CEO of Laus Group of Companies, Mr. Paul A. Laus – President and COO of CWI, Mr. Frank De Jesus – Laus Group of Companies Consultant, Honorable Jomar Hizon – Bacolor Mayor, and Yair Furman – MFTBC.